Not only is Green Bay’s playoff hopes teetering because of an 0-5 record away from Lambeau Field, but its defense is struggling to take away the football. The Packers (4-5-1) rank among the NFL’s best this season defending the pass, bolstered by 34 sacks, but they are near the bottom with only 12 takeaways. Just six of those have been interceptions – three by Ha Ha Clinton-Dix, who’s no longer on the Packers. It’s been that type of head-scratching season in Green Bay. Not helping matters is a Packers secondary that has been shuffled by roster turnover and injuries for most of the season. “We’ve still got guys who are very capable of getting the job done,” asserted Williams, who switched from cornerback to safety three games ago after the Packers sent Clinton-Dix to Washington in a surprising midseason trade. Just who will line up with Williams on the back end of Green Bay’s defense against the Vikings’ dangerous passing game is uncertain. The Packers have four defensive backs on the injury report. Starting safety Kentrell Brice, who missed Green Bay’s last game with an ankle injury, and cornerbacks Kevin King (hamstring) and Bashaud Breeland (groin) are all questionable to play Sunday. “As I tell the staff, as the injuries pile up and we’re continuing to have to juggle, I say, ‘Check the mail. There’s not going to be any sympathy cards from around the league,'” first-year Packers defensive coordinator Mike Pettine said. Especially from the Vikings (5-4-1), who are just ahead of Green Bay in second place in the NFC North and have the league’s most prolific pass-catching tandem with Adam Thielen and Stefon Diggs. The Packers had only one takeaway – an interception by Clinton-Dix – as the combination of quarterback Kirk Cousins (425 passing yards, four touchdowns), Thielen and Diggs rallied Minnesota from a late 13-point deficit to a 29-29 tie at Green Bay in Week 2. What remains of Green Bay’s secondary hopes to flip the script in the rematch. 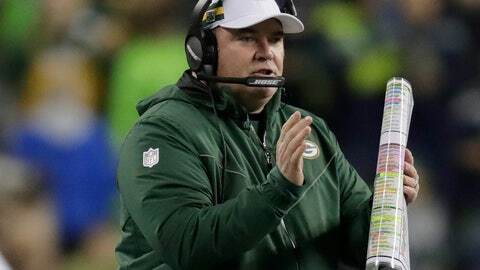 Indicative of their struggles on the road, the Packers have forced just two turnovers in those five games. “We’ve just got to do our job on the back end and get the ball,” rookie cornerback Jaire Alexander said. NOTES: The Packers’ defense will be without DL Mike Daniels (foot) and LB Nick Perry (knee) on Sunday. Daniels moved around in the locker room Friday on a knee scooter with a large cast on his lower left leg. Daniels isn’t sure if he will play again this season after suffering the injury in the loss at Seattle on Nov. 15. … WR Randall Cobb (hamstring) and TE Jimmy Graham, who broke a thumb in the last game, also are questionable for Sunday night.